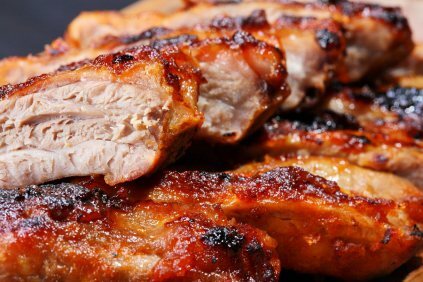 Place Meaty Eats Prepared Ribs in cold water or fridge. Thaw completely. Place fully cooked ribs on B.B.Q., grill 15 - 18 minutes or until heated thoroughly. While grilling ribs, open Meaty Eats Hawaii-Licious sauce, pour into small pot on stove (or side B.B.Q. burner) and warm. When ribs are heated through, to your satisfaction, cut completely between bones and place pieces into large serving bowl or platter. Add heated sauce and turn ribs to ensure each piece is completely covered. Preparation time: roughly 15 minutes.